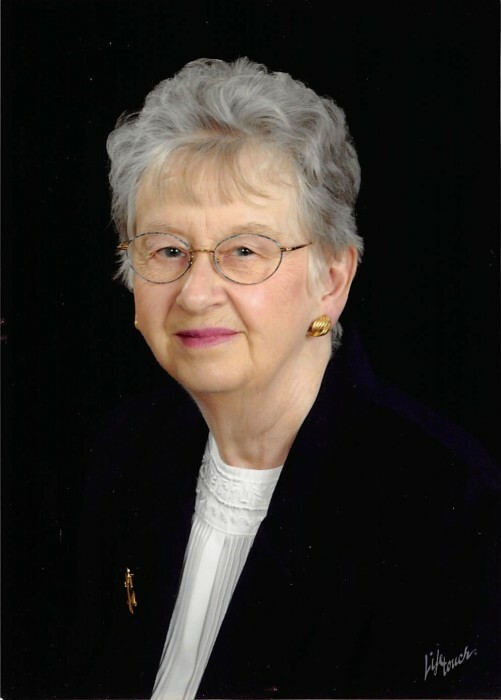 Marie Ann Scott, age 83, went to her eternal home on November 28, 2018, at the Ortonville Area Hospital in Ortonville, MN. Mass of Christian Burial will be held on Monday, December 3, 2018, at 11:00 a.m. at St. John’s Catholic Church in Ortonville, MN. Visitation will be held on Sunday, December 2, 2018, from 2 to 5 p.m. at the Mundwiler Funeral Home in Milbank with a prayer service to follow. Fr. Brian Oestreich will celebrate the Mass, and interment will be in the St. Lawrence Catholic Cemetery in Milbank. Marie Ann (Fonder) Scott was born on September 13, 1935, in Sisseton, SD, to Bernard Richard and Catherine Elizabeth (Jurgens) Fonder. The family resided on a farm northeast of Peever, SD. When she was eight years old, the family moved to farm near Milbank. After graduating from Milbank High School, Marie attended college at Mt. Marty College in Yankton, SD, and Presentation College in Aberdeen, SD. She taught at a country school for one year in rural Roberts County. She then taught at Big Stone City School until she married Ronald Scott on June 4, 1960, at St. John’s Catholic Church in Ortonville, MN. In addition to teaching, she loved bird watching and taking care of her flower garden. Marie was also active in 4-H, the RENEW church program, secretary of DHIA, taught Religious Education, and loved to participate in cancer walks with her team, “Oldies but Goodies”. Surviving Marie is her daughter, Debbie (Leo) Wels of Lewisville, MN; daughter, Cheryl Schweer of Milbank, SD; daughter, LeAnn (Darwin) Street of Milbank, SD; son, Brian (Patty) Scott of Maple Grove, MN; daughter, Lori (Roger) Cloos of Watertown, SD; 16 grandchildren: Brandon Eckberg, Bradley Eckberg, Lindsey Mickelson, Derek Wels, James Eckberg, Andy Eckberg, Nicole Morton, Justin Schweer, Ashley Gatz, Eric Gatz, Abby German, Mitchell Scott, Cali Scott, Bridget Walsh, Tia Cloos, and Caden Cloos; 15 great-grandchildren; and brother, Dennis (Arlene) Fonder of Milbank, SD. Preceding her in death is her husband, Ronald, in June of 1999; parents: Bernard and Catherine Fonder; and brothers: Dale and Jim Fonder.